W T F?! Or maybe, O M G!!! How about "Holy jumpin' dog crap, with a fire hydrant leg lift on the side!!!" Whatever. 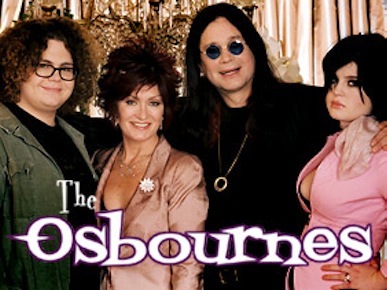 Fox has signed the Osbournes -- Ozzy, Sharon, Jack, Kelly -- to front a new prime-time variety series titled The Osbournes: Loud and Dangerous. The former MTV reality show kingpins will preside over at least six episodes, says Fox, with no air date announced yet. The show's blueprint calls for it to "mix musical performances, comedy sketches and game show competitions with the Osbournes' unique blend of humor and outrageous sensibility." Fox also says, "Move over, Donny and Marie." Here's betting they'll be guesting. ***The storied ESPN team of Keith Olbermann and Dan Patrick will be reunited this fall on NBC's Football Night In America studio show. It'll be a crowded field of play, with Bob Costas, Cris Collinsworth, Jerome Bettis, Tiki Barber and Peter King also returning. "I will be doing the highlights for the red states and Keith will be doing the highlights for the blue states," Patrick joshes. They last worked together from 1992-97 on ESPN's SportsCenter. ***Showtime has a studio team in place for Inside the NFL, which it's picking up this season after a 31-year run on HBO. The ubiquitous Collinsworth will join James Brown and Phil Simms. The premiere date is Sept. 10th.